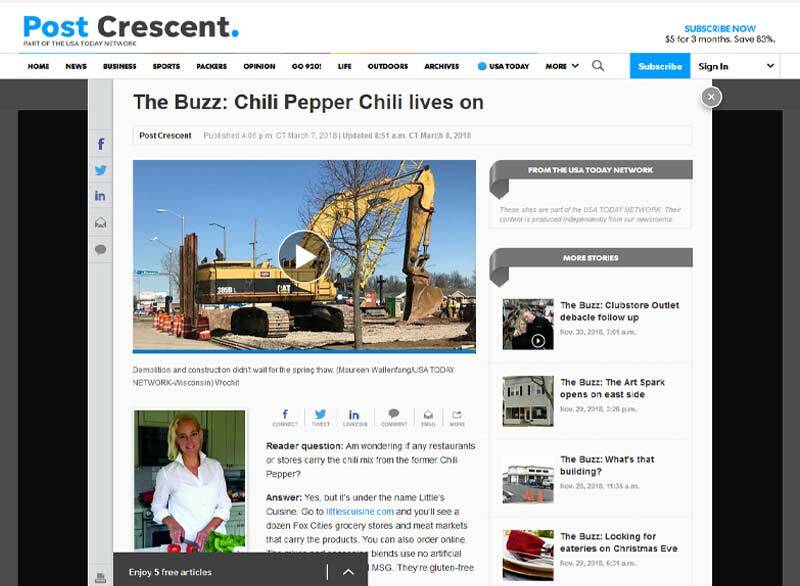 A reader on postcrescent.com asked the question: "Am wondering if any restaurants or stores carry the chili mix from the former Chili Pepper?" Apparently the famed cafe, then operated by two members of the Little family and especially featuring its products, were missed! Reader question: Am wondering if any restaurants or stores carry the chili mix from the former Chili Pepper? Answer: Yes, but it’s under the name Little’s Cuisine. Go to littlescuisine.com and you’ll see a dozen Fox Cities grocery stores and meat markets that carry the products. You can also order online. The mixes and seasoning blends use no artificial ingredients and no added MSG. They’re gluten-free and non-GMO verified.